Uncategories Can the Green win more than 3 seats? This BC election is in its last stretch and if the ridings visited by the leaders are of any indication, it probably means that the close races identified in the latest projections are correct. But one of the big questions of next Tuesday will be: how many seats the Green party can win? The party of Andrew Weaver is poised for a significant increase of its vote share, at least if polls are right and the voters don't change their mind in the last minute. A score of 20% is far from impossible, which would represent more than double the 8.13% of 2013. Back then only Weaver managed to get elected, mostly thank to an incredible "personal effect" that took votes from both the NDP and Liberals. Based on the projections, Weaver is very safe in his riding. Then you have Saanich North and The Island which is also heavily leaning Green (even though a riding poll published yesterday showed a surprisingly tight race, but margins of error are wide). Finally, Sonia Furstenau is in good position in Cowichan-Valley. But what about a 4th, 5th, 6th or even 7th seat? It's possible but unlikely at this point. It'd take essentially one of the following three effects to happen -or a combination of them. The Green could be underestimated by the polls province-wide. Let's imagine for instance that they get 25% of the vote. Another solution would require the Green to concentrate their vote on the Island. They could drop in the interior and the Lower Mainland while going up in Victoria and around. Finally, polls could be right but some Green candidates could benefit from a "boost" or personal effect (either due to themselves or their campaign). One of the possible problems with this list is that it relies heavily on the results in 2013. But the Green party isn't as well established as the Liberals and NDP. Its vote can vary more between election (and without any direct link to the provincial swing). Take the example of West Vancouver - Sea to Sky where the Green candidate, Jim Stephenson, got 22.9% of the vote in 2009. You'd think this riding would then see another increase in 2013? Nope, the new candidate only got 10.98% in 2013. It might of course have been the personal effect of Stephenson, but still, it shows that past results aren't as indicative of future ones. Keep in mind also that my model already increases the Green more on the Island than anywhere else. For every 1% increase province-wide, the model increases the Green by 1.5 points on the Island. the deficits above are therefore there despite already predicting the Green to do better on the Island. So, can the Green party really increase by even more than this? 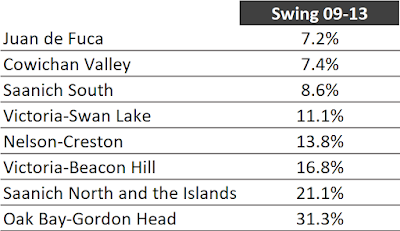 Let's look at the best swing the Green got in 2013. All the ridings but one were already on the Island. The next table lists them along with the swing between 2009 and 2013. Remember that the Green party didn't increase provincially between 2009 and 2013, actually decreasing from 8.21% to 8.13%. That's only half the story however. The Green party wasn't running a full slate of candidates in 2013 (as opposed to 2009) and if we adjust for that, we actually find a positive swing of around 2 points province-wide. 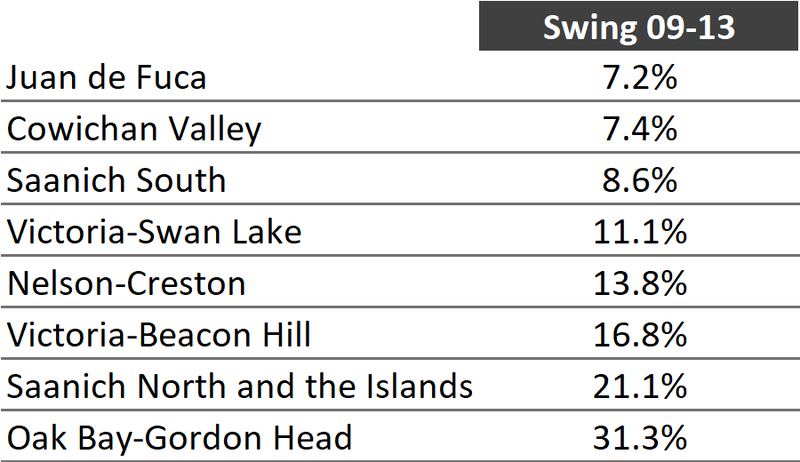 Still, you can clearly see that the swings in this table are way above the provincial one. What happened in 2013 is a strong concentration of the Green vote on the Island. 42% of the votes specifically were on the Island. Overall, the Greens were at 17.5% there, the BC Liberals were at 33.9 and the NDP at 44%. That compares to the 10%, 39% and 50% respectively in 2009. Polls have shown the Green between 22 and 38% during this campaign in this region. The current raw poll average places them at 27%. That isn't enough if they expect to win many seats. The electoral system is such that being third and only at 25% usually leads to very few seats. If we go back to the three solutions to get more than 3 seats and we leave aside option 1 (unlikely), we see that solution 2 isn't met. At least not based on polling data. This leaves the Green solution 3: campaign hard and hope for some crazy personal effects in some key ridings. The problem? The effects the Greens need are fairly high and not everybody is Andrew Weaver or Elizabeth May. One of the issues here is that the ridings the Green can win are ridings that already got a high swing in 2013. It's especially problematic since in many of these, the Green candidate has changed. Actually, all 5 ridings have a different candidate! In Victoria-Beacon Hill, the loss could be especially important since Jane Sterk was running there in 2013 (Note: the model does account for this). She was the former Green leader (before Weaver). It's possible of course that the Green have selected even better candidates this time around, but it's always hard to tell. Looking at the number of twitter followers, it isn't obvious that any of the new candidates is a "star" or running a particularly good campaign (based on Twitter, it seems Janet Fraser in Vancouver-Langara or Donovan Cavers in Kamloops-North Thompson are doing better). Also, it's not like the Liberals aren't trying to win some of these seats. In Esquimalt-Metchosin for instance, they are running Barb Desjardin, a former mayor there. And the NDP will defend these seats since they are needed in order to take the power. This could lead to many unpredictable 3-way races. Knowing this, it might not be surprising to see that many ridings on the Island have had high advance turnout. At the end of the day, projecting the Green will likely be one of the challenges of this election. It's obvious that their best chances are on the Island. What isn't obvious is how many seats they can realistically win. The projections say 3, but the riding poll yesterday in Saanich North and the Island wasn't good news for the Green. It remains that the Green aren't in a position to likely win more seats. It's possible but it involves a set of conditions that is never optimal. Polls are polls, but you are always better being ahead in them the day before the election. For the Green specifically, they need to start hoping the polls are underestimating them. Update: two new polls From Oracle. NDP indeed ahead in Esquimalt-Methchosin. Numbers very close to the projections. On the other hand, Green lower than expected in Cowichan-Valley with the NDP 13 points ahead. With margins of error, it does look like like a 3-way race, as predicted.